Today, in marketing, 'attention' is a massive commodity, but grabbing and holding audience attention may be a problem because of consumers today moving across devices and screens. 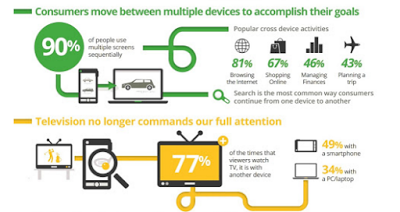 Multi-screen or multi device marketing is a big buzzword. 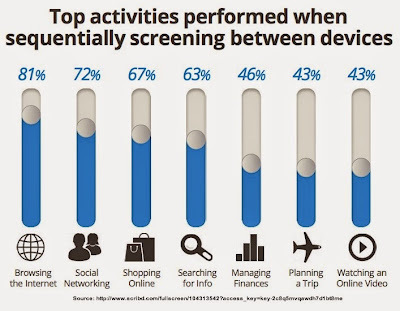 Screen journeying is another. But this new consumer habit may actually be taking away valuable focus and attention to a brand's message. 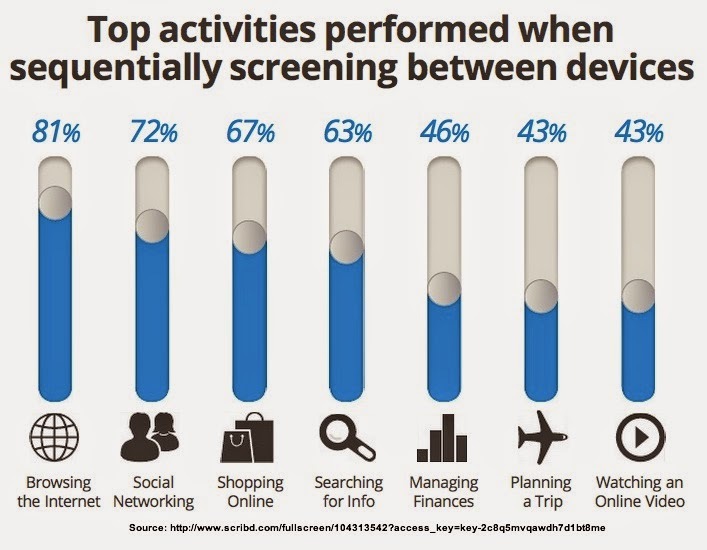 People today are performing sequential screening between devices. Starting on their smartphones, watching a bit of tv on the side and then moving on to a tablet or a laptop/desktop environment. Across these screens, it is becoming a difficult challenge for brands to find and hold attention to the messages they are putting out there – across these screens. Consumer journeys across screens, often in real time, are causing havoc for media planners – and savvy brand managers are beginning to question the effectiveness of their media spend. Or at least, they should be. Add to that, when on their tablets or laptops (besides, of course having the tv on), they have multiple tabs open – moving rapidly from news to social to gaming and back to news and so on. Even within that journey, often they are multi tabbing between social platforms – having facebook, twitter, pinterest and other tabs open all at the same time. So, what does that do for their attention? Specially to a message from a brand that they really did not solicit? 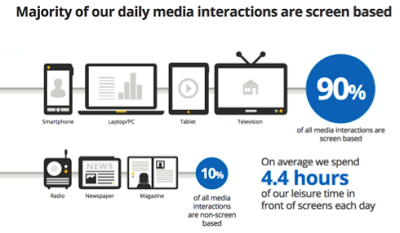 Earlier on, the ad industry jumped at the idea of an increase in consumer engagement across multiple screens. This was a broadening of horizons beyond TV (the ‘first screen’ once). We talked about the shift from monologue advertising (lean back TV) to dialogue and lean forward engagement. Experience, participation, multi-platform engagement became buzzwords. What we blinked on was the fact that the proliferation of screens today fuels fragmentation – it causes consumer ADD – Attention Deficit Disorder. And we were caught dozing. Writing in an article on 'single tasking' in Fast Company, Kevan Lee suggests that for the aware consumer single tasking is the key. Because multi tasking takes away from productivity, from attention, from focus. And what does that do for consumers paying attention to brands and messaging? Havoc, I suspect. Lee writes "A THREE-SECOND DISTRACTION LEADS TO DOUBLE THE MISTAKES!" Researchers tested 300 Michigan State students on their ability to persevere through interruptions while taking a computer test. The interruptions came in the form of pop-ups that required the students to enter a code. In one case, the interruption lasted a little more than four seconds. In another, the interruption was 2.8 seconds. With a 2.8-second interruption, the students made double the errors when they returned to the test. With the 4.4-second interruption, the error rate quadrupled. An Ohio State University study found that media multitasking – e.g., reading a book while watching TV--results in poor cognitive performance on both tasks; we keep doing both anyways because we get an emotional boost when we do. And yet, despite the evidence that doing more than one thing at a time just doesn’t work, we continue to fall victim to doing more and focusing less." So, if single tasking is the new mantra for those who are really trying to be at their best, how does that work for media planners seeking attention for their messages? How does that work with the habit of time-shifting and place-shifting – watching programs on their tablets or other devices – and not on tv on the slotted hour? Brands need to get both their creative and media plans in order again. Because while single-tasking may be a consideration, it is against the norm. What is single-tasking? Well, it’s all there in the name. Single-tasking means doing one activity at a time with as few distractions and interruptions as possible. So, in today's world of ADD (Attention-Disruption-Disorder) combined with multi tasking a brand's message needs to effectively cut through the clutter, be relevant, add value, and be in context. Each and every time. And if it is content driven – which again is the new way – that content needs to be both entertaining and relevant. Content that is working these days is infotainment content – providing information on and around a brand's products and services in an entertaining, useful way. So, yes, a brand's reach is being challenged. There is just so much going on in that living room space that cutting through and then ensuring that the intended message sticks, the intended action takes place is really something that needs to be focused on. yes, a consumer's journey map is important, understanding the various twists and turns is good, but what is vital is a brand's ability to put really well thought out signs along the way. So that in the path of that journey, the consumer may stop for a second and engage. And remember. And act. And buy. And that's the basics. That's Digital Marketing Strategies 101. This is a very insightful article. 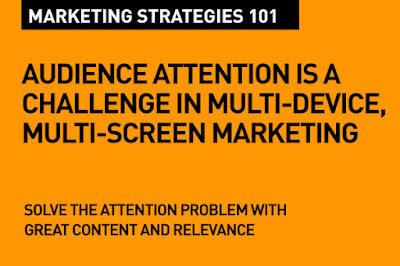 It is so true that today's consumer is so busy, jumping from tv to mobile, to iPad, to also multi tasking, that unless you have a real break through content, you cannot win the eyeballs. No wonder that brands don't figure on YouTube's most watched channels, but influencers do. Because brands and marketing people simply cannot get over advertising, and are busy trying to grab attention with cool ads, rather than provide useful and value-adding content. Once you start looking at marketing from the consumer viewpoint, it changes for the better.